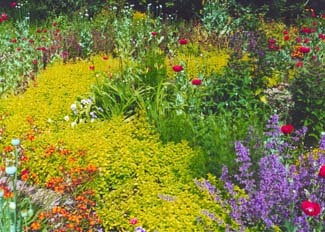 Atmospheric walled garden with a Eucryphia collection. In its own way Seaforde has the answer to Japan’s cherry blossom viewing season. 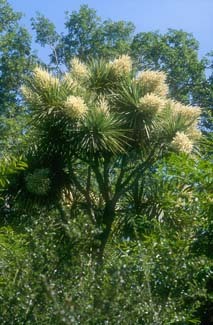 The garden holds the national collection of eucryphias, known poetically as the ‘White Knights of August’. Gleaming with clouds of white blossom crowned with golden stamens and a-buzz with contended bees, the 19 different varieties of Eucryphia, planted in two allées, are a sight to take root in memory. 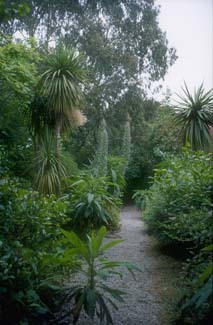 The gardens date back to the mid18th century and belonged to the original Seaforde House, which was burnt in 1816 and replaced. They have been reclaimed by Patrick Forde and, in place of the labour intensive bedding designs beloved of Victorians, the pleasure grounds now have a hornbeam maze with a rose bower made from the skeleton of a Nisson hut, and a summer house built from central heating pipes. 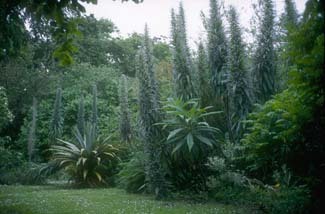 Echiums grow to giant proportions in the shelter of the walls and climbing roses romp through trees and lilies and tender Melianthus major luxuriates amid magnolias, rhododendrons and the willow leaf podocarpus. Other attractions include a nursery with many unusual shrubs (some propagated from Patrick Forde’s plant expeditions to the East), a tropical butterfly house, and a woodland walk leading to a pond. Just outside Seaforde on the Belfast-Newcastle Road.